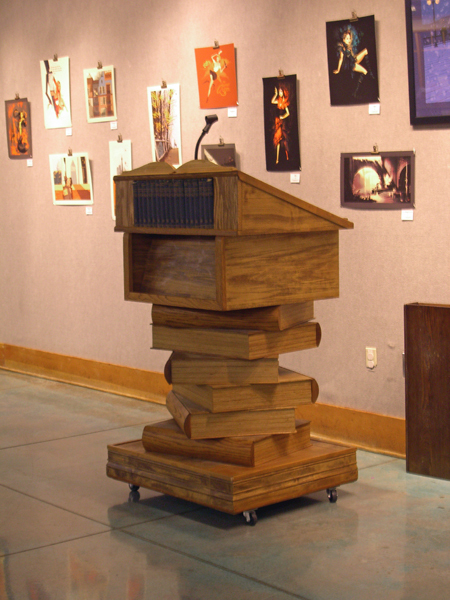 This is the lecturn that Powell’s Books provides for guest speakers. Cool, isn’t it? I love the book stack and the faux shelf of books at the top. Just below the faux book shelf is a place where books (I guess most frequently written by the guest speaker) can be displayed during an event. Like Stephanie Pearl-McPhee Casts Off, for example. This lectern is large enough to almost entirely hide Stephanie, except for her head from the chin up. I’ve missed The Yarn Harlot the last couple of times she traveled to Stumptown. I almost missed her this time. I looked online to see if there was a bus or something that runs from where I work to Powell’s, because I knew that finding a place to park would be nearly impossible. Portland has this wonderful invention called fareless square. You can ride any of the mass-transit options for free, as long as you stay within this area. I work at one end. Powell’s is at the other. Free ride — how often does that happen? And, it turns out that the Portland Streetcar, which stops only a block from work, would drop me off and pick me up right next to Powell’s. How perfect is that? When I arrived at 5:30, there were already a goodly number of knitters in attendance, but I managed to get a great seat. Powell’s main store is so large (an entire block), and so maze-like that the different areas of the store are painted different colors so it’s easier to find your way around. I’m sure that it’s much simpler for employees, when asked for directions, to answer go through the Blue Room, then down the stairs and through the Gold Room. Stephanie would be speaking in the (I am not making this up) Pearl Room. But now perhaps they will rename the Pearl Room the Stephanie Pearl-McPhee Room. 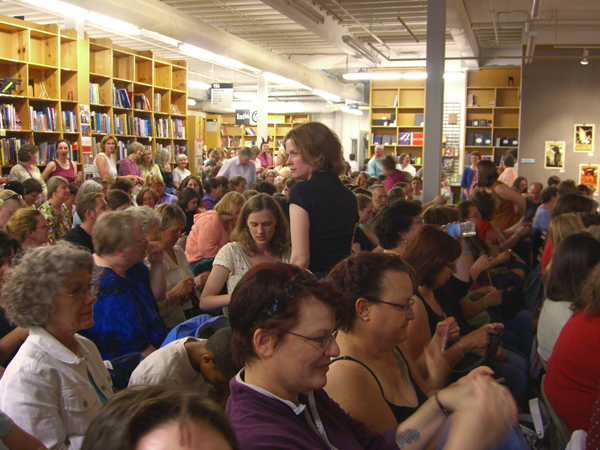 As I arrived, the intrepid Powell’s employees were cramming as many folding chairs as they could into the open area in front of and to either side of the lectern. Apparently they partially learned their lesson after last year, when they booked her into the tiny Powell’s Home & Garden store and did not even provide a microphone. By 7:15, Powell’s looked like this. Powell’s tried to limit the audience to a number reasonable for the area provide, and closed the door when the limit was reached. I’m not sure of the truth to the rumors that a few knitters simply bypassed the closed door by taking the elevator. Would knitters do that? 😆 At any rate, by the time Stephanie arrived, it was standing room only, and the aisles were crammed. I saw so many people! 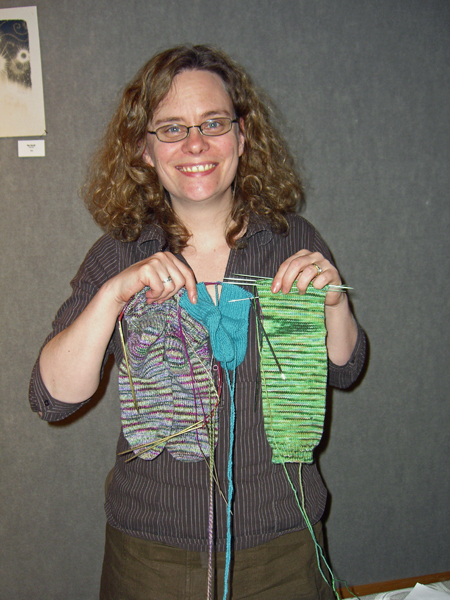 Nurse Knitter was there, T, Lori – she had her socks with her and they look great. I sat right behind Monica, who has cards for her blog! And I saw several people who I met at the Magical Moebius Festival and I love you all and I know I’m forgetting bunches of people and I’m sorry. I’m a dork. Next time I will take better notes. But I kept trying to finish the little baby socks, which were barely past the toe increases when I left work. It was the perfect gray cashmere, so I had to buy it. This is the third sock I’ve started. (said very earnestly) Sometimes, when you frog something out, you just need to let the yarn rest a little while and then it almost seems like it’s brand new when you start to knit with it again. It’s almost as good as actually buying new yarn. But not quite. Stephanie was funny and witty and earnest. I loved her talk about knitting and knitters and the amazing things we can do when we put our minds to it. She started by describing what a worrier she was. Having grown up with a command-performance worrier in the form of my Mama, I laughed and laughed because the description rang so true. Stephanie worried about all of the sheep in the world suddenly losing all of their fleece. She asked us to picture the battles between crocheters and knitters over the last of the yarn. Crochet, you know, is so much faster! Most of the time, Stephanie had us all in stitches (pun intended). The part about she and Joe attending a swanky cocktail party, and what it meant to admit she was a knitting author, was particularly funny. And there were boos (aimed towards the banks involved) when she mentioned Blue Moon’s problems with their bank over their sock club orders. And the issues another woman had when trying to get a business loan to open an online yarn store. There were cheers when she talked of the amazement from another fund raiser at the speed (72 hours) with which knitters could double the amount donated via Tricoteuses Sans FrontiÃ¨res (Knitters Without Borders). At this writing, an amazing $320,093 has been donated. There was time for a couple of questions afterwards. Someone asked about the traveling sock taken hostage at BEA by Ann and Kay. Stephanie was pleased to announce that her no negotiation policy had payed after all, and the sock was on its way home. Then it was time to get in the long, long, long line. And my true dorkiness began to shine. As I prepared to gather my stuff together, a very nice woman tapped me on the shoulder and asked if I was the magic cast-on lady. I admitted that I was. She said some very kind words about the cast-on and how pleased she was to meet me. And I thanked her and asked her name (which I think was Terry? And if it wasn’t or if I’ve spelled it wrong, please let me know right away so I can fix it, because I’m such a dork with names). I picked my stuff up to get it out of the way of all of the knitters who were stumbling over my purse (I’ve driven cars that were smaller) and my other junk. And the lovely lady came back with Melody (who gave me her card, sparing me from totally humiliating myself by forgetting her name, too). It turns out that they had come all the way from Coeur d’ Alene, Idaho, to see the Harlot. So we had Idaho in common, I being born and raised in Idaho Falls and not only knowing where Coeur d’ Alene is but how to pronounce it. Melody owns Harmony Yarn Studio, which looks like such a cool little store. I will definitely visit if I’m ever in the area. This is so big, for me to meet you, Melody said, can we please take my picture with you? And that rendered me totally speechless and feeling all weirdly cool and embarrassed at the same time, and of course I was happy to oblige. They were both so sweet and kind and fun to meet. And the picture… it was pretty hot in the Pearl room, and it was pretty humid. Yeah… The incredible expandomatic hair was at it again. When I gasped ohmygod, my hair!, Melody kindly replied, don’t worry. We’ll explain about the hair. Now… I’ve been trying to explain about my hair for years and years. 🙄 I wish her luck with that. Melody, if you are reading this, maybe you can send me the explanation so I can use it in the future? I’m serious. And then I went to stand in line. And then I remembered that I had neither taken a picture of the Harmony Yarn ladies or written down the first ones name. And now, of course, it was way too late to do that. And I banged my head against the nearest bookshelf a few times in lieu of kicking my own rear end, because I’m a dork. Harmony Yarn ladies, you were wonderful and I am not usually quite so spacey. The line went on and on and on and moved very, very slowly. So slowly that I actually finished the baby socks while I stood in line. Babies have such tiny feet, as we’ve already established. I knit for about 4 hours straight, while waiting for Stephanie, while she spoke, while waiting in line. It was a bit too much for my hands. By the time I got to the head of the line, my hands were hurting and clumsy and my brain was beginning to shut off even more than it already had, if that were possible. Low blood sugar? Yeah… that’s my story for what happened next, and I’m sticking to it. Stephanie was just as warm up close, in person, as I knew she would be. I said, nice to meet you, and passed over my book calmly, and then gushed can my socks meet your sock? Stephanie giggled and said of course they could, because her tours were really about socks meeting and not about books at all. After some fumbling, I managed to partially untangle the two pairs of socks in my little knitting bag, so Stephanie is holding both the Spanish Lavender Basket Wave socks and the little baby socks, along with her traveling sock. Book signed and picture taken, Stephanie looked closer at the Basket Wave socks and stroked the yarn a little. That’s the Rockin’ Sock Club yarn for April — Silkie Socks That Rock in Walking on the Wild Tide. I’m not knitting the club pattern, but I’m pleased with the results. I said. Or that’s what I meant to say. Yeah, Stephanie nodded. It’s the Silkie stuff. It looks nicer knitted up than in the skein. Thank you, I croaked, and began gathering up my stuff because I knew that she was tired and there was still a line of knitters behind me and I couldn’t talk and I needed to disappear quickly into a hole in the ground because I couldn’t make my mouth work along with my brain. I was carrying my purse (small cars, etc. ), my knitting bag containing yarn and various tools, the two pairs of socks on two circs each – now outside the bag, my sweater, Stephanie’s book. My hands were very clumsy, and I kept dropping things. I picked up the bag and dropped the book. I picked up the book and dropped a pair of socks. I picked up the socks and dropped the other socks. I picked up the socks and dropped the bag, and the socks, and my sweater. ohmygod I wanted to just die. Take your time, Stephanie said. Do you need help? No, no, no. I’m so sorry. I managed to get out. Then I finally captured all of my errant objects and made my escape. Ugh. How embarrassing was that? Gentle reader, isn’t that the most extreme case of dorkiness you’ve ever heard of? I know. It’s the universe’ way of keeping me humble. P.S. In case anyone wondered, I’m watching the Portland Rose Festival Grand Floral Parade right now. It’s raining. Tradition is preserved.